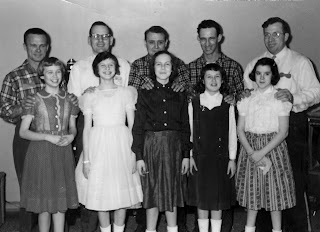 Here are two photos of the children and teachers in 1956-57, about the time the Greer home was reaching its limit. Notice the smaller children are on benches that someone in the branch made so that as many children as possible could crowd together. 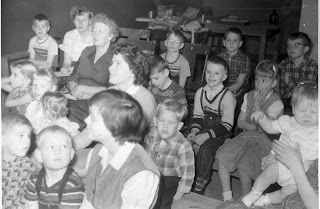 Above, Primary children and teachers, 1956-57: front, Margaret Sullivan, Ginger Erekson holding Craig Boswell, [boy with head turned], Margie Reynolds(? ), Steven Doty, Cris Erekson, Vera Resch. Second row: [girl behind Ginger’s head, probably a Boswell], Cathy Sullivan, Kathleen McGuire holding Ann McGuire, Paul Doty, Rose Marie Resch holding Dottie Sullivan(?). Third row: Myrtle Greer, Erek Erekson, Tommy Spahr, [boy], [girl]. Fourth row: Bucky Spahr (with back turned), Billy Spahr (hidden), [boy], Tom Erekson, John Resch. 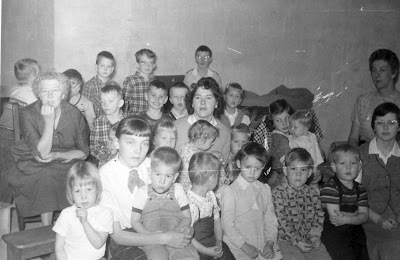 In the picture below, most people are seated in the same location, and because the pictures were taken from different angles, we are able to identify more of the children. In addition, Gladys Sullivan is now seated to the left of Myrtle Greer. 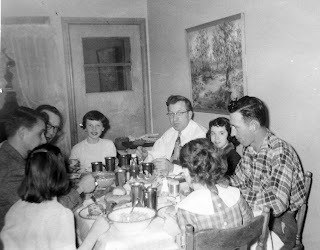 When special Primary activities were held at the Greer home, Jim and Myrtle became “guests.” Here are photos of two consecutive Daddy-Daughter dinners, 1958 and 1959. Seated around the dining room table in 1958, clockwise from the front left corner: Cheryl Swords, Chuck Swords, Earl Spahr, Rose Marie Resch, Fred Woolcott, Julia Woolcott, William and Anita Aymar. February 28, 1959: [Mr.] and Joan Wilbershied; Earl Spahr and Rose Marie Resch; Charles and Cheryl Swords; Bill and Anita Aymar; Fred and Julia Woolcott. Honestly, I am glad callings don't last that long anymore. I cannot image all the people/families that were touched my her service in primary!